VR Zone writes AMD is planning to refresh its Brazos lineup in Q1 2012 with Brazos 2.0. This new platform will feature a new chipset and higher clocked Zacate APUs. The new A68M chipset is a more energy efficient chip that cuts some features that were unnecessary for sub-notebooks, while adding RAID 0/1, native DisplayPort support, APU fan control and SD controller. Codenamed Brazos 2.0, the platform will feature updated Zacate APUs. (Ontario/C-Series refresh is not mentioned) The E-450 will be replaced by E2-1800. Fundamentally the same chip, E2-1800 features a slight boost to 1.7 GHz, while the GPU is rebranded as HD 7340 and is clocked higher at 523 MHz and 680 MHz with Turbo. 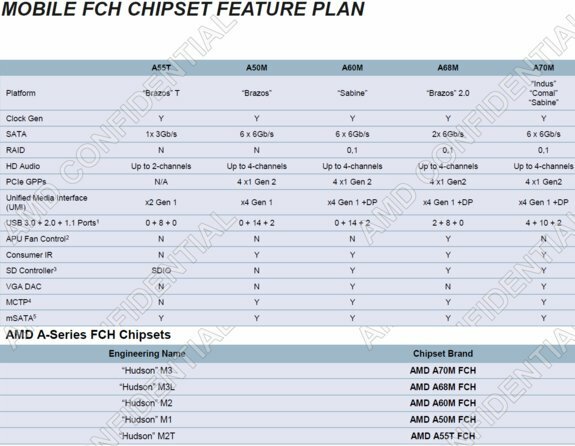 Computerbase also mentions in the possibility of a CPU turbo which will help E2-1800 differentiate itself from E-450. CPU turbo is already available on C-60 which is based on the same chip. E-300 will be replaced by E1-1200, clocked at 1.4 GHz, up 0.1 GHz from E-300. The HD 6310 GPU will give way to HD 7310 which features an insignificant 12 MHz overclock. Q1 2012 will also see the launch of the Brazos-T platform for tablets. This platform will feature a cut-down, optimized A55T chipset and a power optimized Hondo APU. Later in the year Brazos 2.0 will be replaced by the 28nm Wichita and Krishna APUs.